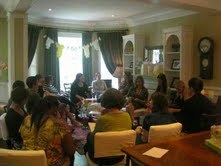 We used yellow and green since Baby is a mystery, and our “theme” was basically baby clothes. 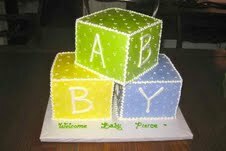 This served a couple purposes–it gave us something gender neutral to work around (all babies wear clothes you know), the decor was also a gift to the mother-to-be, and it was green–no extra stuff! There was another over the mantel in the family room/kitchen area, and then another across the front window, which is where we opened presents. It’s a little hard to see since the sun comes in, but trust me–it turned out even better than we hoped. Anyhow, tangent. I actually didn’t do most of the food (one of the other hostesses did) since I was in charge of the paper products and presentation of stuff, but she made a-maz-ing savory bread puddings–bacon, leek & gruyere. We should try a veggie version sometime. I did handle some pretty food though (although the prettiest thing I did was the yellow and green M&Ms–sale Easter with the wrong colors sorted out by Jay & I) (bless his heart the poor boy’s partially color blind but he sorted six bags of M&Ms with me). We ordered a fancy cake from The Swedish Bakery, which is also not far from the host’s home. Love. There were a zillion mousse/filling/preserve/cake options, which was like a fun bonus math problem (nerd alert!). We went with classic, simple and delish. The last fun detail was pretty last minute but made a huge impact. A close friend and former co-worker of the mother-to-be now owns a boutique bakery in Arizona. He sent us cake pops as a gift for the shower. 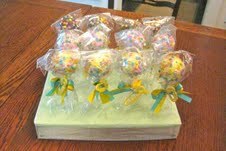 Clearly, wires were crossed, because we were under the impression we were getting 20 cake pops, in a variety of flavors. Turns out, we were getting a variety of flavors, 20 cake pops each! 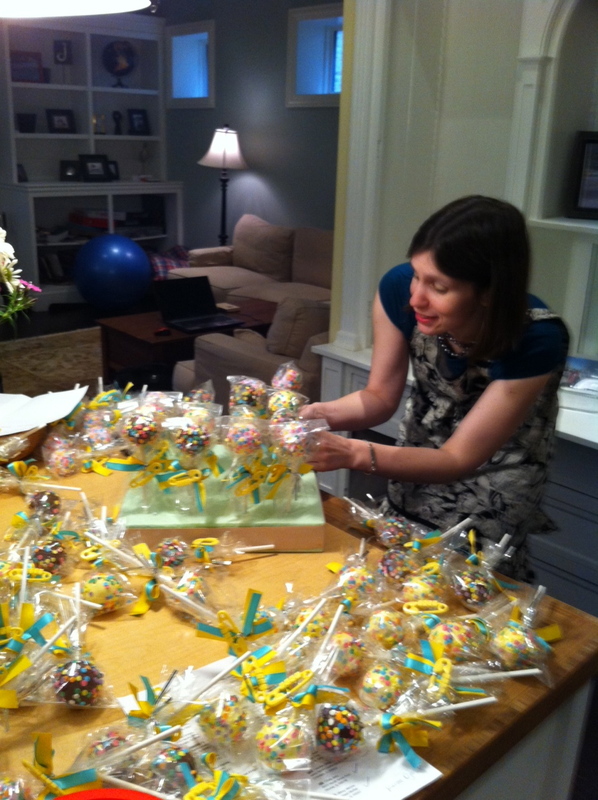 Check that out (and spend a second trying to fathom how much it would have cost to buy 60 super fancy cake pops). He even put little yellow “baby” safety pins strung on green & yellow ribbons on each. Its 2 inch styrofoam, and I wanted a pale green. All I had was a lime green tissue, so its a sheet of green with white over it, and then a gold ribbon pinned around the edges. I stabbed the block with a pen to start each hole, since you need to be gentle with the cake pops. Straight pins were my BFF with the styrofoam, since tape didn’t really stick. I used tape so the paper wouldn’t tear, but it was pins actually pulling it taut. He sent us three flavors: red velvet (purple coating), chocolate (yellow coating) and pistachio (chocolate coating). We mixed up the explanation at the shower. Oops. They were all good though, so hopefully no harm no foul. I also gave her coordinating thank you cards (thanks students that helped make them–you’re the best! ), which we thought was a fun touch. 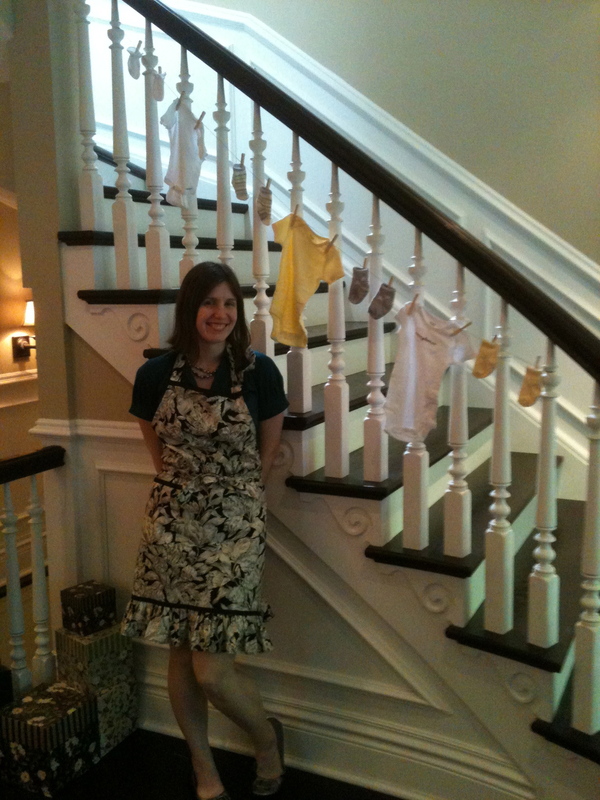 *That is the host’s apron that her MIL made her for Christmas. LOVED. I basically wore it the whole party. Totally cuter than my dress. I’ve always made fun of the ruffly aprons but I WAS WRONG. Love, love, love. I really want one now. LOVE the apron! I was totally going to comment on that until I saw at the end that it wasn’t yours. I want my mom to make me one now (and I’ll have her make you one too). And savory bread pudding sounds like an awesome way to use up the many, many, many….many….veggies I’m getting in my CSA box. Can you get the recipe?